A bit like buses, another companion volume to SHHH! comes along within the space of two years, after a break of twenty-four years! HELP! is bigger, and funnier rather than scary. Peter and I had an absolute hoot putting it together and we love it. 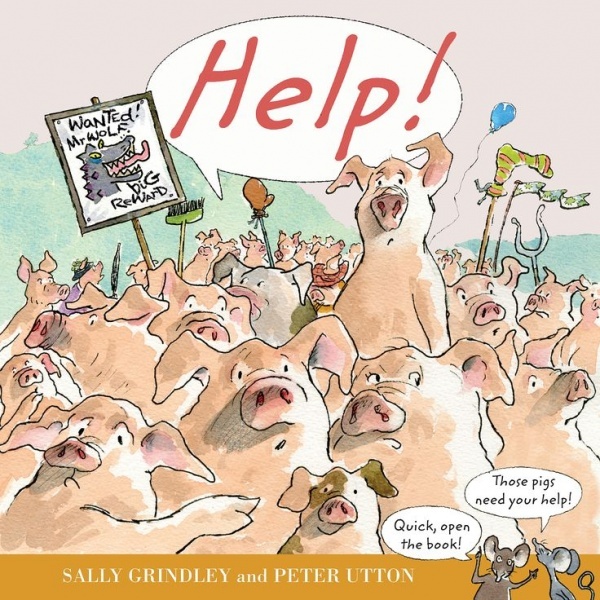 It’s based very loosely on the tale of The Three Little Pigs, but here we have a whole village of pigs all requiring your help to thwart that Big Bad Wolf. Elements of SHHH! can still be found, but with a definite twist. We hope you’ll love it as much as we do! 1) There are lots of flaps to open. 2) The mouse commentary all the way through. 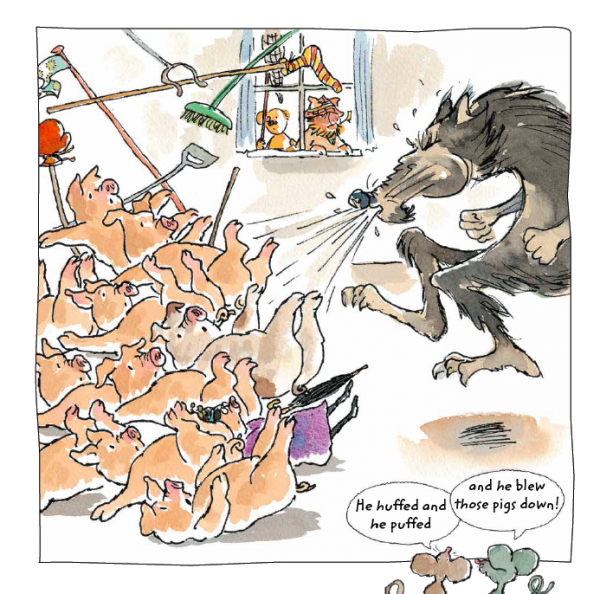 It came about because I couldn’t think how to introduce the best known lines from the original ‘Three Little Pigs’ story – ‘He huffed and he puffed and he blew the house down’. 3) Pigs having picnics, an old lady pig with an umbrella, grandfather pig with his wheelbarrow, and lots more vignettes. 1) Have a child or children lift the flaps, turn the pages and shut the book at the end. 2) The child listener has been invited to help the pigs catch the wolf. Be sure to let the child answer the questions that are asked throughout. 3) Have fun building up the tension as you join the pigs in chasing the wolf. Adopt squeaky voices for the mice! 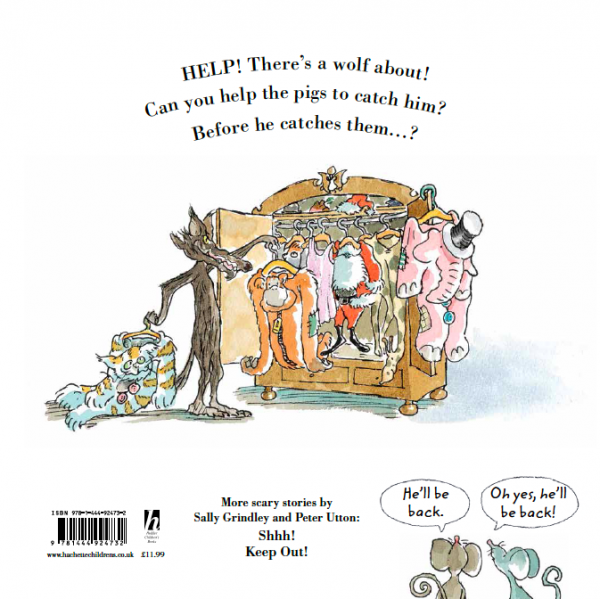 1) Revisit the original story of The Three Little Pigs. 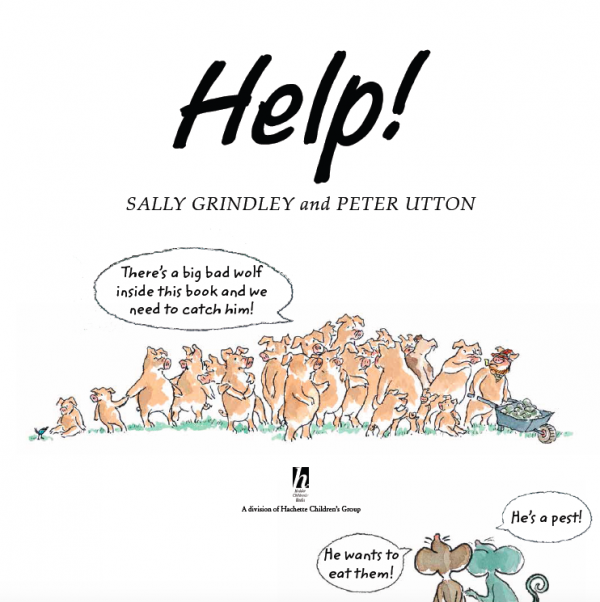 2) How is the ending different in Help! 3) What other things could you use to catch a wolf? 4) What will the wolf wear next, and what other animal costumes might he keep in his wardrobe?